designer bags and dirty diapers: Zucchini Farro Cakes + Giggle Bites For Your Kids! Today is all about healthy eating for you and your kids. First I wanted to share a recipe I made last week for our Meatless Monday meal, Zucchini Farro Cakes with Slow Roasted Tomatoes. I loved this meal, but disclaimer Matt hated it and ate a box of poptarts later. Keeping it real that the men in your lives may not love this meal:) It was a light, fresh, and fun new way to eat zucchini and farro. I served the cakes with Tzatziki sauce but next time I might would serve with crumbles goat cheese or even add goat cheese or some kind of cheese in the cakes. I thought they needed cheese but I do love cheese, so you make the call! Don't skip the tomatoes they are awesome and added such amazing flavor! This recipe makes a ton of cakes (about 12) so you can freeze them or save for your lunches! To prepare cakes, combine zucchini and 1/2 teaspoon salt in a cheesecloth-lined bowl (I used a mesh strainer lined with a thin dish towel) Let stand 10 minutes. Gather edges of cheesecloth; squeeze zucchini in cloth until barely moist. The second part of today's post is about baby and toddler food! I am so darn proud of my friend Melissa I can't stand it. For years she has talked about wanting to start her own baby food line and recently she and her husband finally did it!! I briefly mentioned it a few weeks ago, but the line is called Giggle Bites. 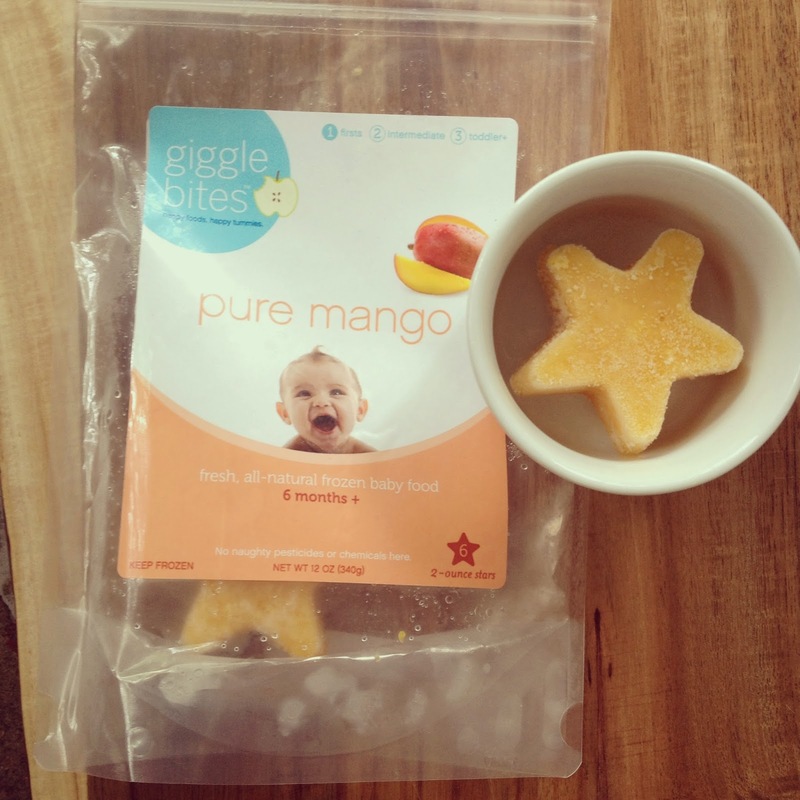 After her first child was born Melissa had a hard time finding pure baby food with nothing extra added to it and that is how Giggle Bites came about. I am sure you are thinking what makes this baby food different from others? Well, first it is all frozen, meaning there are no additives or preservatives to give it shelf life. There is actually nothing in the baby food but the actual fruit and/or veggies. It is frozen making it the freshest, healthiest food you can feed your baby! This is all I have been feeding Frances since she turned 4 months and the doc gave us the go ahead and she loves it. It is so easy, all you do is pop a star out of the freezer and leave at room temperature to thaw, or pop in the microwave for about 30 secs, it is that easy. Frances has tried all the firsts : sweet potatoes, green peas, mango, and apples and she loved them all! I can't wait to try out some of the second foods once she hits 6 months. This post is kind of a tease because currently Giggle Bites is only available in Charlotte, but Melissa is working to get it in several big stores in the Southeast so stay tuned you should be able to buy it soon! Charlotte friends all next week Giggle Bites is offering free delivery of your orders with code MOMSROCK for Mothers Day, so go stock up! You can buy a box of 4 bags or 8 bags of any kind to meet the delivery minimum. You will honestly probably want more, since it is frozen you don't have to worry about it going bad! We go thru a bag a week with Frances! You can shop online HERE and also check out Melissa's blog, it is filled with so much valuable info about kids food. She has really opened my eyes to so many things about shelved baby food. Ha! Guarantee Mike would not be a fan of farro cakes either! ;) Sounds perfect to me though, especially with a crisp glass of white! And that baby food is such a great idea, I'm sure she will do well! 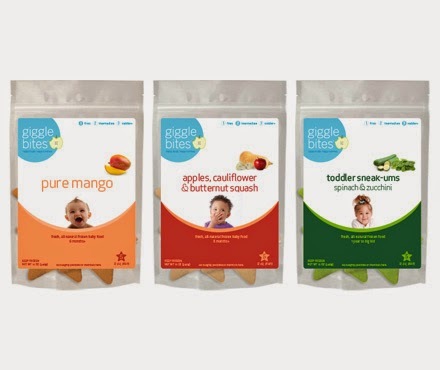 Giggle Bites also sounds awesome...hopefully by the time I'm having kids it will be available in Virginia!